From January 8 till February 13, 2011, in the space of Kim? / FK gallery the solo show of painter Inga Meldere – “Unwritten” – took place. In 2010 for participation in the 14th Vilnius Painting Triennial only two artists from Latvia were chosen – Inga Meldere (1979) among them. 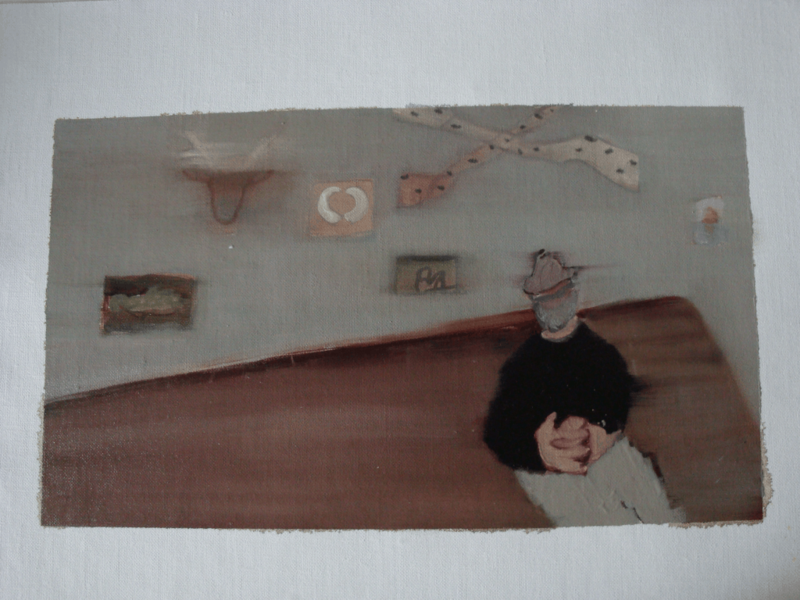 In the exposition “Unwritten” a bit more than thirty small scale oil paintigs were included. Works were created the same year in Helsinki and in Strasbourg. The style of works is specific. One could even use word ephemeral for describing these paintings thus warning a spectator that a certain precaution for approaching them is needed – piety for the situation that actually does not say much. Half spoken word – gesture, in this case – can be much more thoughtful than it seems at the first moment. It is possible that this was influenced by a circumstance that the works were created in two very different places – artist residences in Strasbourg and in Helsinki. With a short break in between, Inga Meldere has spent quite a lot of time in both of them, and in each place the artist was alone, so her work was hardly disturbed by any social activities how it definitely would have been in her home town. At one point this was a time of a singleton reflection and meditation when myself becomes the only thing that actually connects one to the world. Such relationship is extremely sensitive. Paintings show this feeling very clearly. A man is the most active agent in them, while the artist herself is the observer. The paintings are intertwined with characteristic style, but not with a common narrative. Each work is about something different – a moment in time and space enlightened by sensibility of the author. Other people, most probably unaware of that, have been initiators with their activities, works and verbalized thoughts. The image of a man that exists in paintings is like a marionette – through its anonymity one can perform, intensively emote and fixate these moments of mental experience. Sensitive grasp, especially the sensitive grasp of humanity, is not sudden and random in the creative work of Inga Meldere. It seems that this method is developed on purpose by personal but partly subconscious motives. The accelerator of the whole creative process is the artist herself – her emotions, adventures, experience and inner wisdom that in the moment of careful but natural observation gets connected with a detail from the outer information blast – an image, a specific nuance like a word, sound or action. It is wandering in reality, seeking for some clues in life for oneself.